Traffic laws alone cannot regulate every type of driving situation that may occur. There are some general rules which drivers should understand and follow. Read this chapter with care. Someday these safety tips might help you avoid a crash, serious injury, or even death. These are only general statements and cannot dictate your actions in all situations. It is up to you to evaluate the situation and make a determination as to the best course of action. After starting your vehicle, check around your vehicle for hazards or approaching traffic, including bicyclists and pedestrians, give the proper signal and move cautiously into the stream of traffic. Good posture while driving is important because it allows a better view of hazards and more control of the vehicle. As a general rule, when gripping the steering wheel, place your left hand at the 9 o’clock position and your right hand at the 3 o’clock position on the wheel. Some manufacturers recommend placing your hands at 8 o’clock and 4 o’clock positions when the vehicle is equipped with air bags. Check your owner’s manual or contact your vehicle manufacturer to determine which position is best for your vehicle. Always keep both hands on the wheel unless you are safely performing another driv­ing-related task, such as activating your turn signal. Do not drive with parking or hazard lights on. Hydroplaning occurs when there is standing water on a roadway. At speeds up to 35 mph, most tires will channel water away from the tire similar to the way a windshield wiper cleans the windshield. As your speed increases, tires cannot channel the water as well, and your tires may start to lose contact with the road and ride over the water like a set of water skis. In a standard passenger car, partial hydroplaning can begin at speeds as low as 35 mph. At 55 mph, the tires may lose all contact with the road. If this occurs, there is no friction available to brake, accelerate, or steer. It is possible for the vehicle to go into an unpredictable and uncontrollable skid. 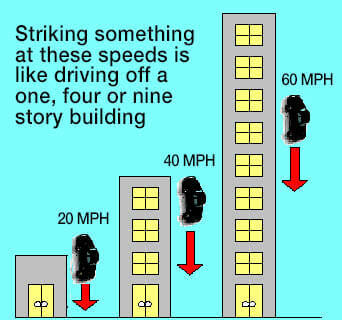 If this occurs, take your foot off of the accelerator, letting the car slow down. To prevent hydroplaning, maintain good tires with adequate water-channeling thread on your vehicle. Most importantly, slow down when there is water on the roadway. A car skids when its tires lose their grip on the road surface. When a car skids, both the power that the engine sends to the wheels and the braking ability of the wheels are lost. Slick surfaces can exaggerate normal movements. If brakes are applied too hard, or the wheel is turned too sharp, a skid can occur. once you have regained control of the vehicle, you can lightly apply brakes and steer in a safe direction. Remember, the first half-hour of rainfall is the most dangerous because roadways become extremely slip­pery when the water mixes with oil and other chemicals on the road surfaces. Curves in a roadway are potential sources of hazard for drivers. Because of the maneuvering involved, it is more likely that a less cautious driver may fail to maintain their lane while driving through a curve. When roadways are slick because of rain or other hazards, curves can be especially dangerous and require much lower speeds than when the road is dry. Sharper curves are usually marked with a safe miles-per-hour sign. Usually less than the posted speed limit, these advisory signs indicate that the reduced speed shown will make driving through a curve safer. Reduce your speed before entering these curves. If, while driving through the curve, you realize that you are traveling too fast, do not forcefully apply brakes because this may cause your vehicle to skid. Instead, take your foot off the accelerator, carefully apply the brake, and continue steering in the lane of travel. Uneven terrain and obstacles make it difficult to safely maneuver a vehicle once it has left the roadway. Serious injury or death can result from a crash if this happens. To avoid leaving the roadway while driving, pay attention to road conditions. Drive at or below the speed indicated on a regulatory sign or an advisory sign indicating potential hazards. Drive defensively, being mindful of the actions of drivers around you. Wait until your speed has reduced, check the traffic, and look for a place to safely return to the roadway by merging into traffic. If necessary, come to a complete stop before re-entering the roadway. Unlike a slow leak which may cause a tire to go flat over time, a blow-out occurs when the tire ruptures and goes flat immediately. If this occurs while your vehicle is in motion, it can cause you to lose control. If you experience a sudden tire blow-out, do not panic. Follow these guidelines to maintain control of the vehicle. Do not move to the shoulder of the road until the car has slowed greatly. If the blow-out causes the car to swerve on to the shoulder, do not try to get back on the pavement. Let the car coast to a stop. See the guidelines above for what to do when your vehicle leaves the roadway. Watch for hazards or changing road conditions ahead. Get your car serviced routinely. Stock your vehicle with necessary tools and supplies. Don’t drive with a defective muffler or exhaust system. Move a victim of carbon monoxide poisoning to fresh air, contact emergency medical services, and give artificial respiration if it is necessary and you are trained to do so. Steering locks are anti-theft devices found in most cars manufactured since 1969. Steering locks can cause dangerous situations for drivers who are not familiar with their operation. If a vehicle’s ignition is placed in the lock position while the vehicle is in motion, the steering capability of the vehicle will be disabled, and the driver will be unable to steer the vehicle. Further information concerning steering locks is available from the Automobile Safety Foundation at www.carsafe.org. A rear-end crash is caused by following another vehicle too closely. When fol­lowing another vehicle on any street or highway, there must be enough distance for you to safely stop if the vehicle in front of you suddenly slows down or stops. 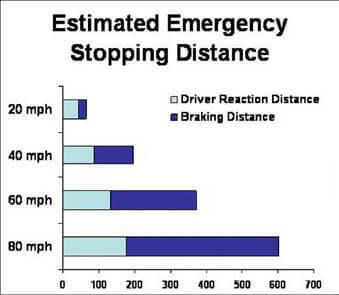 One way to determine if there is enough distance between your vehicle and the vehicle in front of you is to measure the amount of time between when the vehicle in front of you passes a reference point and when your vehicle passes the same reference point. Watch the car ahead of you. When it passes a reference point, such as a telephone pole or street sign, count “one-thousand-one, one-thousand-two.” If you pass the same spot before you are through counting, you are following too closely. During inclement weather, during construction, during heavy traffic, and always at night, the distance between your vehicle and the vehicle in front of you should be even greater. Speed is a leading fac­tor in serious injury and death as a result of traffic crashes. The greater the speed, the greater the force of impact. The illus­tration below conveys the relative force of impact when you strike a fixed object. The operation of motor vehicles has a significant impact on Georgia’s air quality. Emissions from cars and light duty trucks contribute to the formation of ground-level ozone, a component of urban smog. Vehicle emissions can react with sunlight at high temperatures to produce unhealthy levels of this form of air pollution. This is especially true during warm weather. Vehicle emissions and ground-level ozone can be reduced by proper vehicle maintenance in accordance with the manufacturer’s instructions, and by fewer trips and vehicle miles traveled. In the thirteen-county metro Atlanta area, gasoline-powered cars and light-duty trucks that are less than 25 model years old must pass an emissions inspection every year prior to registering their vehicle with the county of residence (the most recent three model years are exempt from this requirement). The thirteen metro coun­ties covered by the state’s inspection and maintenance program are: Cherokee, Clayton, Cobb, Coweta, DeKalb, Douglas, Fayette, Forsyth, Fulton, Gwinnett, Henry, Paulding and Rockdale. For more detailed information about the emis­sions inspection program, call the Georgia Clean Air Force at 1-800-449-2471. Remember removing or disabling a vehicle’s emissions control components is a violation of federal and state law. In addition to proper vehicle maintenance, you can help reduce air pollution and traffic congestion by limiting driving to necessary travel, by planning ahead to consolidate trips, and by using carpools, transit and ridesharing. All drivers should do their part to reduce the impact of automobiles and trucks on air quality and the environment. Minimize your idling time. Eliminating unnecessary idling can reduce fuel consumption, engine wear and air pollution. When warming up the engine, follow the manufacturer’s guidelines to assure sufficient engine performance for safe driving. Idling a vehicle for 10 seconds will consume more fuel than restarting the engine. An expressway differs from normal roads or highways in that access to it is controlled. Vehicles can only enter and exit the expressway at specific places known as interchanges. Most expressways in Georgia are free, but there are a few that require a toll. With the exception of the controlled enter/exit points and HOV lanes, expressways are similar to traveling on a divided highway. There is a median separating traffic traveling in opposite directions; lanes are marked with dashed lines, and the edge of the roadway is marked with a solid line; slower traffic should keep to the right; and all traffic laws and guidelines associated with safe driving still apply. The entrance ramp is a short one-way road that leads to the expressway. From the entrance ramp, you should move into the acceleration lane. This is the lane that runs alongside the main roadway. In the acceleration lane, you can adjust your speed to the speed of the expressway traffic. When safe to do so, you should merge into traffic. Vehicles on the expressway have the right of way, but courteous drivers will permit you to move into the expressway traffic. Prepare to exit a controlled access highway by safely moving to the right lane for an exit on the right, or the left lane for an exit on the left. Guide signs will tell you of the approach­ing exit. At the exit, deceleration lanes are provided for slowing down when leaving the expressway. Posted exit speeds are usually low due to the design of the roadway. Drivers should use either brake lights or a turn signal to indicate a change in speed to the drivers behind if slowing down in the traveling lane when preparing to exit. Drivers operating vehicles on divided highways must drive to the right of the median unless directed to do otherwise by a sign, traffic control device, or police officer. Drivers must obey the yellow or white striping on the roadway that indicates lanes, the convergence of lanes, or areas in which vehicles should not operate. Drivers may only access or exit controlled-access roadways at designated entrances and exits. The term “gore” means the area of convergence between two lanes of traffic. The gore is the area, usually similar to a triangle, formed by solid white lines between an existing lane of travel and a merging lane of travel. Gores are most often seen at the convergence of an acceleration lane and the adjacent travel lane on a controlled access highway. The gore is the area bounded by solid white lines between the acceleration lane and the adjacent travel lane. Drivers entering the controlled access highway are prohibited by law from crossing this solid white line, and are required to continue traveling in the acceleration lane until the solid white line disappears. High Occupancy Vehicle (HOV) lanes are travel lanes that are restricted to vehicles with more than one occupant, buses, motorcycles, and vehicles with Alternative Fuel Vehicle license plates. The lanes are marked with a diamond symbol and the hours of restriction are posted. The penalty for violating HOV lane restric­tions is a fine up to $75 for a first offense; up to $100 for a second offense; up to $150 for a third offense; and up to $150 plus one point added to the violator’s driving record for a fourth or subsequent offense. High Occupancy Toll (HOT) lanes are I-85 Express Lanes that allow registered transit, three or more person carpool, motorcycles, emergency vehicles, and Alternative Fuel Vehicles to use the lanes toll-free. Never trust other drivers to do what you think they are going to do or what you think they should do in a particular situation. The fact that a left turn signal is flashing does not necessarily mean that the driver is going to make a left turn. You should constantly be thinking of an “escape route” as you drive. For example, if you are approaching a curve, you should be looking closely at the shoulder and nearby area to determine what you would do if a car approaching from the other direction crosses to your side of the road. After a little practice this will become more instinctive.